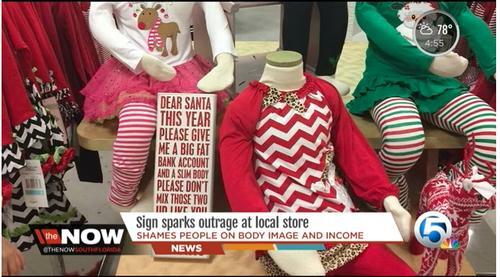 A woman in Florida photographed a sign in a Dillard’s Department store that said ““Dear Santa, This year please give me a big fat bank account and a slim body. Please don’t mix those two up like you did last year. Thanks.” If you’re thinking that the women shopping for clothes were appalled, you’re almost right. The sign wasn’t in the womens department, it was in the girls department. That’s right, cute stripey leggings and Christmas sweaters with a side of body hate, just what every little girl wants, whether she celebrates Christmas or not. 1. Where was the sign supposed to go? 2. How could you think it was ok to put this sign anywhere but in a fire? Gods forbid any woman or girl go more than 5 minutes without being reminded that, even if it were possible to be too rich or too thin, she definitely isn’t getting it done. And best to start as early as possible, why settle for just commercializing a holiday when you can use it to reinforce poor body image and fat hatred in little girls? Of course this gets the inevitable “can’t you take a joke?” response. Anytime someone points out that an attempt at comedy may be hurtful, it’s almost immediately suggested that they lack a sense of humor, have a stick where normally there is none, that they need to learn to take a joke, etc. First of all, nobody is obligated to celebrate humor made at their expense so pardon me if I don’t think it’s hysterical to tell girls that they should ask Santa not to look like me. Also, I’m having trouble distinguishing between the kind of body shaming that paralyzes girls and women, encouraging them to view themselves as constantly inadequate, spending tons of time, money, and energy approximating a stereotype of beauty, and that has encouraged a 119% increase in eating disorder hospitalizations for kids under twelve, and the kind of body shaming that’s somehow hilarious. And let’s be clear that a couple talented people advertising people could have come up with ten funny iterations of this that aren’t based on body shaming faster than you can finish a pumpkin spice latte. Perhaps rather than complaining that people need to take jokes and pick battles we could invest time in creating funny things that don’t stigmatize people for how they look. I read about this today and I was so outraged. My first thought was WTF!? My second thought was “I hope Regen writes about this”. And I’m so very happy to see that you did! I really hope that the disgusting sizeism (not to mention classism) of that sign and the attention it’s getting will shed some light on the ridiculousness of fat phobia in our culture. I hope at least a few people will see this and let it be a light bulb moment. The joke was far too weak a joke to be a good one. It was unsurprising – you knew what was to come when you had read the first sentence. A predictable punchline is lame. So it was not even entertaining – only offensive. So true. And even with jokes that are more funny and less offensive – I don’t have to “learn to take a joke”. I don’t have to laugh because someone else wants me to, I can decide for myself what is funny for me and what not, that’s totally “my underpants” as well as my weight! Had I seen the sign I would have picked it up and took it to costumer service and gone “Not only is this not funny but is that something you really want to be teaching children?” then ask for all the signs to be removed. I agree with your actions you would have taken. I have worked multiple retail jobs and have brought poorly worded and out right offensive signs to the store’s attention when I saw them. I would also ask that if anyone sees a sign like this that they are kind to the worker’s who might only be working there because it is the only job they could get, it is not their fault. Now if they say something stupid* (*stupid to me is knowing better, being better educated and doing the opposite or ignoring it) while you are nicely informing them of this then that is a different story. I would go above their heads to their supervisor or best of all store manager, who is the best to talk to if possible, I record such conversations and also write an email and send it to the store, the company and who ever else I think can change their staging plans. I love them saying it was a mistake where the sign was placed when clearly the mistake was that the sign was produced in the first place. It wouldn’t be funny in any section of the store. It’s classist as well as fatphobic, and it’s a lazy excuse for humor. Body hate is no joke. It leads to no end of negative consequences, including death. So no, I will not ‘lighten up’ in any sense of the term. Sadly the staff who was spoken to most likely did not design the “planagram” that tells all the stores how and where each item shoud go. I wish someone at some store saw it and objected to it, but I’m sure they need the job and might sadly lose thier job for saying something. I know that is unfair, but so is life. I wish the person could have said something better on the spot and pray that later they realized how horrific the sign really was. They should have apologized and left it there. I would have complimented the worker if they had given you the store manager and company’s information so you could pass the complaint up the cchain to where it needed to go. Going to the news also helps fix things even faster since it is such bad PR for the store. I am a recovering anorexic (there is no “all better” for eating disorders, just learning how to change the feedback loop), I still have thoughts, but have learned how to love my body how it is. Seeing things like this are a trigger for bad thoughts for me, but I know how to break the feedback loop. It is our children, girls and boys, are over exposed to such things daily and we need to change all things like this and teach everyone to one to love their body what ever thier healthy shap is for each person. I will have to write a blog on this since it brings up so much for me I want to share with everyone. Sorry for the slight tangent, but I completely agree with you and every word of your comment. OMG. I did not see this so thank you for bringing it up. You can bet your bottom dollar that Dillards or any company associated with them will not see a single one of my dollars this Holiday Season! One of your best blogs on the evils of marketing, holiday or otherwise. Thank you, Ragen. I tweeted this to Dillard’s. Gee, just what I really wanted for Christmas, sizeism with a nice heaping helping of classism. I just looooooooove being reminded that I’m too fat and too poor to be worth anything. No…wait…the other thing: I HATE IT!!!!! Dillard’s stock is trading on the market at a bogus inflated rate. If you own Dillard’s shares, the best way to protest this blatant “thin and rich,” and very real Company philosophy; is to dump your stock before the NYSE prices continue to fall! Dillard’s is a Family owned company, and I shall not shop at their stores this 2014 holiday season. Shame on Dillard’s! Stores need to stop being so hateful to their potential customers. And I am still why haters are still calling hate speech comedy. Thank you for posting about this and also for your outrage. I will also be sure that Dillards and any stores owed by the same company; in the same way Old Navy and Banana Republic are related, I know there is another company in this specific group but I can’t recall it right now, but this company has not done such things as Dillards did. I am lucky to be alive to day and am still dealing with the thougths from when I became Anorexic, I have been in recovery for over 8 years, but that little voice of Anorexia never fully goes a way. It is like being an alcoholic in the way I take it one day at a time still and talk to a support group when I feel stressed or pressured becasue the urge can return even all these years. I was 5’10” and 165lbs and just got my womaly body features when my Anorexia started due to the fact I couldn’t find clothes in the junior department and the cruelty of the children. I had the changes occure during the summer shortely before the school year started. The last thing other Anorexics/Bulimics, recovering Anorexics/Bulimics and people considering Anorexia/Bulimia (or anyone with an eating disorder, poor body image/body image disorder, ect.) did not see that sign. There is too much body/size shaming in our culture and media to add this to add this “decoration”/advertising only adds to it. I hope and pray that other girls and women who saw it do not go down the same road I did and don’t start to hate/feel ashamed of their body due to this horrific sign. I have learned to not shop at locations that fat/size/or in any other way shame people based on their looks. I have not shopped at Dillards for a long time due to service issues, but now I will not due to this shaming. Thank you for sharing this and makeing us aware. I’m glad that I was able to reblog this post onto my own blog. This blog has been an important and vital part of my own healing work for some time. I can’t say enough good things about Regan and her vital activist work. I hope that you can read some more of the posts here at Dances with Fat and get as much from it as I do. And I’m also looking forward to seeing you more on your blog and hopefully on mine at Kate is Rising as well.